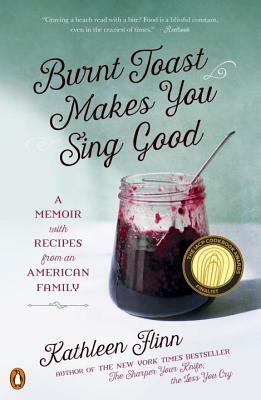 A family history peppered with recipes, Burnt Toast Makes You Sing Good offers a humorous and flavorful tale spanning three generations as Kathleen Flinn returns to the mix of food and memoir readers loved in her New York Times bestseller, The Sharper Your Knife, the Less You Cry. Brimming with tasty anecdotes about Uncle Clarence’s divine cornflake-crusted fried chicken, Grandpa Charles’s spicy San Antonio chili, and Grandma Inez’s birthday-only cinnamon rolls, Flinn—think Ruth Reichl topped with a dollop of Julia Child—shows how meals can be memories, and how cooking can be communication. Burnt Toast Makes You Sing Good will inspire readers (and book clubs) to reminisce about their own childhoods—and spend time in their kitchens making new memories of their own. KATHLEEN FLINN is the author of The Sharper Your Knife, the Less You Cry, a New York Times best-selling memoir about her experiences at the famed Le Cordon Bleu in Paris. She leveraged her French culinary training to understand what holds home cooks back from cooking in her widely acclaimed follow-up The Kitchen Counter Cooking School, named a 2012 Non-Fiction Book of the Year by the American Society of Journalists & Authors. A trained journalist and writer for more than 25 years, Flinn’s work has appeared in more than three dozen publications worldwide. She lives in Seattle and Anna Maria Island, Florida, with her husband, Mike, and their trusty rescue dog, Maddy.